In the past CIPPE 2018 this March, GN solids control showed the 1 set skid mounted oil sludge treatment unit. This unit has all necessary functional device to recover oil from oily sludge; it can be used in small flow rate oil sludge treatment system or as a demo unit for user to verify if GN’s solution can solve the problem in disposing their oil sludge. Many visitors to GN booth showed their interest to try this unit. One of the visitors contacted with GN few days after the show and placed the order for this system. This oil sludge treatment unit is consisting of premixing procedure, 2-phase separation procedure and 3-phase separation procedure. The main technologies used are flush washing for oil demulsification and separation for different phases like oil, water and solids. The purpose is to recover as much oil as possible and achieve as less waste discharge as possible. 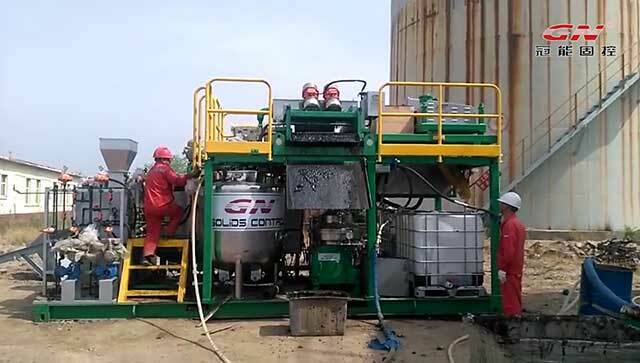 Feedback from customer is saying that GN skid mounted oil sludge treatment provides an effective solution for them to treat the waste oil sludge in the pit on their rig site. They are considering starting up the further cooperation with GN by placing order on GN module type oil sludge treatment system with large treating capacity. The premixing procedure applies premixing tank with thermal system as well as the chemical dosing system. Oil sludge need to be with certain liquidity for easy transportation and mixing with chemicals. GN Mini Shale shaker GNZS752 and 9 inch decanter centrifuge GNLW224 are the main equipment used in 2-phase separation procedure, these are GN main product that have been approved with good performance and quality, 2-phase separation is to remove as much solids as possible from the demulsified oil sludge. Pictures here show the oil, water and solids discharged from the 3-phase separation process. A disc centrifuge is used in this step to receive the liquid discharged from decanter centrifuge. By running at a high speed, the disc centrifuge can effectively recover the oil from the slurry. GN is able to provide large size oil sludge treatment system with larger capacity to help client to recover oil and get much benefit. For more information, please no hesitate to contact with GN.